Minuteman SentryPlus Software - SentryPlus auto-shutdown and monitoring software is included with every unit. RS-232 and USB Communications - No special USB drivers are required for USB communications as unit is automatically recognized by Microsoft® Windows® as HID-compliant device - similar to a mouse or a keyboard. SNMP compatible - Each PRO-RT unit can be managed on a network with the addition of an optional SNMP management card. Fax/Modem/Network Line Protection - The PRO-RT UPS provides a low cost means of protecting fax/modem/network lines. RoHS Compliant - All PRO-RT products are manufactured using non-hazardous materials making them safer for the environment and a green-friendly addition to any data center (Excludes lead acid batteries). Warranty - Each PRO-RT UPS system is covered by a three-year parts and labor warranty and $100,000 Minuteman Platinum Protection Plan® (U.S.A. and Canada only). The PRO-RT Series can be used to support servers, telecom or VoIP systems, security systems, plus many other applications. 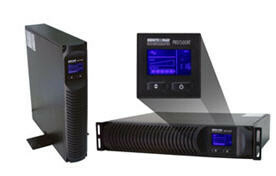 The Minuteman PRO1000RT UPS comes with 6 battery backup/surge outlets, 2 surge-only outlets, USB and RS232 communication ports, SentryPlus power management software and diagnostic software, and fax/modem/network line surge protection.An LCD display provides visual notification of power status, including input voltage, frequency, percent of battery charge, estimated runtime, plus many other conditions.